I started Long Life Saunas to create effective tools for health and well-being. In my experience, there is nothing that feels like a near infrared sauna! In Vermont, I have had the privilege of working with some truly great carpenters and craftsmen. Together, we have created unique and innovative saunas of exceptional quality that are designed to provide years of service. As a company, our goal is to produce the best quality products, provide the best quality service and have a good time doing so. As you read through this site, you will see that we are not a big corporate health interest. 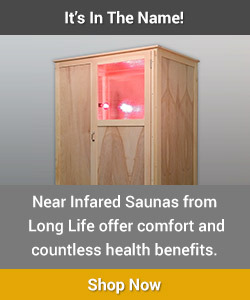 Nor are we a large infrared sauna importer. Instead, we are one of the only built in the USA sauna makers because we care about quality. And, to give you the very highest quality, we build each and every sauna by hand, to order. On a personal note, my journey with near infrared sauna therapy started in 2004 when I built my first unit. I was amazed at the effect and how I felt after using it. In my body, I have experienced a total relief in back pain, clear skin, clear thinking, mercury and copper detoxification, lowered blood pressure, and much more energy on a daily basis. More importantly, though, I feel a great emotional relief and a sense of security knowing I have the ability to stay healthy with my own efforts. I feel optimistic and I no longer worry about chemical and heavy metal toxicity because I can easily remove these things from my body. In this day and age, it is no small feat to feel secure about one’s health. We are bombarded daily with a message of fear about disease and the “threat” of lack. In truth, those media messages are simply untrue and serve the purpose of keeping people repressed and depressed. Once you learn the truth, you can choose to create a life of health and wealth that knows no limits. Near infrared saunas are one of many tools available to you to help you rise above the message of disease and despair and move into a lifestyle of peaceful feelings and perfect health.